#10 envelopes in 24lb. bright white paper. They feature a blue security tint on the inside to keep their contents private. These envelopes have a Peel & Stick closure. 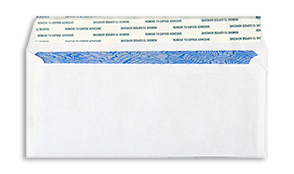 Simply remove the strip of paper covering the glue and close the envelope to seal.